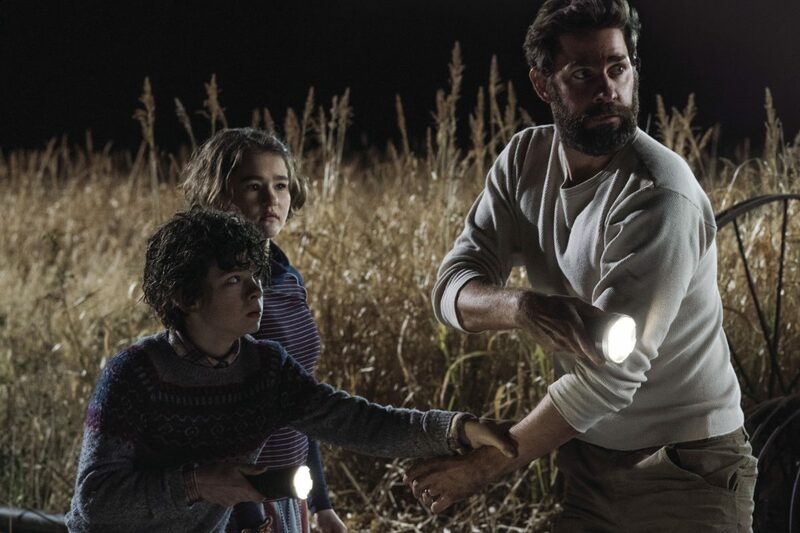 This image released by Paramount Pictures shows Noah Jupe, from left, Millicent Simmonds and John Krasinski in a scene from "A Quiet Place." “A Quiet Place” is almost wordless, yet accomplishes what only the best horror films can achieve: a frenetic tumble of internal dialogue among the audience as we question what is seen and felt. Throughout the film, the carefully planned silence of the survivors of a mysterious invasion presses against the stillness of a decimated countryside, billowing into the theater like a pressurized cloud, the moments of noise slicing through like lightning. To remain seated without cringing in imagined pain or squirming nervously in the seat is a marvel of composure few will be able to reach before the explosive conclusion. John Krasinski directs and stars alongside real-life wife Emily Blunt as Lee and Evelyn Abbott who, with their three children Regan (Millicent Simmonds), Marcus (Noah Jupe), and Beau (Cade Woodward), have survived almost three months after a worldwide catastrophe due in large part to their masterful preparation and response to the threat. They march single-file like elephants to and from the deserted town on a trail of sawdust under their bare feet, which not only reduce sound but increase feeling as to the changes in the ground surface. Before we even know why, we see a focused, fluid teamwork between family members as Evelyn scours shelves for medication and Lee looks for tools and random machine parts. The children understand the situation at different depths, looking to their parents for guidance, but while they see what to do, they don’t always understand why. After a tragedy befalls the family, the parents’ vigilance heightens at their farm just outside of town, where they have strung up a communication system of colored lights and speak sign language to each other, no doubt learned before the invasion. Regan, the oldest, is hearing-impaired and wears an aid in her right ear, which her father constantly modifies to little effect. Millicent Simmonds is absolutely wonderful as the preteen daughter, already bolstered by what some would see as a disability, experiencing all the emotions and identity crises of a typical adolescent multiplied by the guilt and anger over her family’s situation and her place within it. Noah Jupe is equally terrific as the anxious and terrified Marcus, countering his sister’s steady calm with a hypersensitive countenance. While Regan experiences her world through a series of pulses and vibrations, Marcus almost hears too much, as the sounds of the outside constantly swirl around him. For both children, their parents are a well-intentioned but unreliable source of protection, as they have seen that monsters do exist and that no family is immune to tragedy. It is through the children that Krasinski wisely balances the drama of family structure with the horror of their new situation: they have to build a new foundation in order to survive, and the youngest Abbotts are at the most precarious point of stability. I used to have conversations with my middle-school students about what makes an excellent horror movie, images or sound, and we usually concluded that the latter had a bigger capacity for terror because it brought all the buried fears and insecurities in our subconscious to the surface and created mental images more frightening than what was on screen. Certainly, Marco Beltrami’s ominous score and the sound design team led by Erik Aadahl, Brandon Jones, and Ethan Van der Ryn do an outstanding job of turning ordinary noises into markers of doom. Once it becomes clear that the creatures hunt using a magnified sense of hearing, all the normal horror-movie tropes of careful movements and casual missteps turn into a knuckle-biting series of inevitable dangers. Even more powerful are the sounds that aren’t on the screen but made within our own heads in reaction to scenes, as when a character steps on a nail and has to muffle a scream, or when a boy is lost in a corn maze, or when the cries of a new baby might as well be tornado sirens beckoning the monsters to feast. Tempering the tension of the more harrowing scenes, however, are the moments of bittersweet tenderness between parent and child at a raging waterfall, when they are able to speak freely, or a mother listening to a heartbeat in utero with a stethoscope, or two exhausted parents dancing to Neil Young played over an iPod. The family still takes these rare moments to treasure each other between calamities, and the parents structure their family’s existence in future terms. As the film’s conclusion borrows from the Shyamalan book of twists, we see the Abbotts regaining hope through that careful planning for the future, in the efforts of the parents to give their children the best life possible and prepare them to be independent. After such prolonged tension, it is cathartic to see such a release.